Comedy is a mighty polarizer. Just a few nights ago, I sat bored while a hundred or more people around me were laughing up a storm. Yes, humour is very personal and very specific. Last night, I had the pleasure of watching two ladies that do it for me: Gwynne Phillips and Briana Templeton, The Templeton Philharmonic. They played at The Theatre Centre as part of The Toronto Sketch Comedy Festival. Clad in black tights, they don numerous wigs and jackets—even some beards—to portray several characters that seem normal, but aren’t… quite. 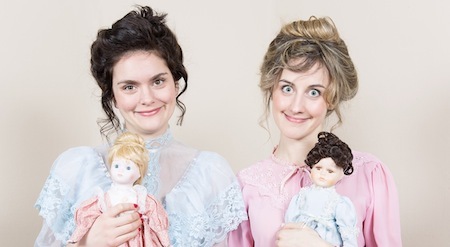 These ladies—and their comedy—are a little bit sneaky. They give us a peek into the dark and ludicrous possibilities that exist in familiar set-ups. My favourite sketches went something like this: a commonplace situation is established—a bookclub meeting, fashionable ladies at lunch—then, moment to moment, something dark and strange is revealed lurking beneath the veneer of normalcy. Things seem right and proper, then the façade cracks and we’re given a glimpse of some interior freakshow. One of their more out there sketches was an absurdist take on a 1950s suspense film trailer. I was impressed by the David Lynch atmosphere they created with just some trenchcoats, wigs and a perfect premise that’s both eerie and laughable. There are some upbeat dance sequences that take us from one sketch to another. Not only do they help keep the pace up, they’re almost an extension of the sketches. The physical comedy here is so fluid and graceful that it almost seems like dance… a creepy, giddy dance. I love these ladies! Take a look at the picture above. See their eyes? See the madness? It’s terrifying… yet endearing. If that appeals to you (as it does me), then you should visit their website and see this duo’s next gig.